EAST MILLINOCKET — For more than a decade, Mike Michaud cast votes in Congress on trillion-dollar budgets, against major free trade agreements and for the landmark health care reform bill known as the Affordable Care Act. This month, in a living room-sized space in the East Millinocket municipal building, he was voting again. He approved the minutes of a previous meeting, granted a property tax exemption for a local veteran and consented to a $5,000 transfer from reserves to repair a town ambulance that had hit a deer. The most substantive debate may have come during a 10-minute executive session about the town’s ongoing negotiations with a major company that owns hydropower assets on the Penobscot River. No action was taken. If there are ex-members of Congress who see ignominy in such mundane work, Michaud is not among them. In fact, he seems entirely at home – though perhaps overqualified – for his newest role as town selectman. Michaud, 63, moved back to Maine for good in late 2016 after stepping down from a position at the U.S. Department of Labor under President Barack Obama. Four years removed from his sixth term as a Democratic member of the U.S. House of Representatives and from an unsuccessful bid to unseat Gov. Paul LePage, Michaud wasn’t looking to run for office again. But people in town kept asking him. He’d be great, they said. So Michaud thought about it. “This community has given a lot to me. I feel like I should give back,” he said. Asked what the biggest difference was between being a town selectman and a member of Congress, Michaud offered a practical answer first. “Well, I don’t have a staff, for one,” he said. Michaud then said he likes the idea of being so close to the ground, where he might be able to see things come to fruition without dozens of congressional hearings, or Congressional Budget Office scoring, or partisan wrangling. Part of it, though, is that he can’t seem to stop serving. “I’m not one to just sit around,’ he said. His timing is good. East Millinocket, like nearby Millinocket to the west and Medway to the south, is a town in transition. The paper mills that built the towns are gone and so, too, are many of the people. Homes have been abandoned. Businesses struggle. The creation of the Katahdin Woods & Waters National Monument about 25 miles away, coupled with its status as an outdoor recreation destination, has given the region something it hasn’t had in years – hope. But the town’s future is still uncertain. Michaud has long been anchored here. Though he grew up in Medway, his grandparents lived in East Millinocket. He now owns and lives in their house, which is within walking distance of town hall. He graduated from Schenk High School, then went to work at the now-shuttered Great Northern Paper mill like so many others. It was there that he became a union leader and settled into a life of public service – 14 years in the Maine House of Representatives followed by eight years as a state senator, the final two as Senate president, then 12 years in Congress, then as a candidate for governor. 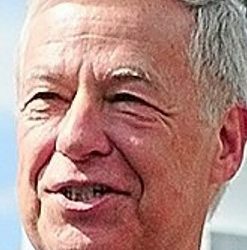 Among a dozen people interviewed by the Portland Press Herald/Maine Sunday Telegram who know Michaud, each one said his decision to run for his local select board was unsurprising. He’s a collaborator by nature, uninterested in his own self-importance, they said. While many former members of Congress find status, and sometimes fortunes, on the public speaking circuit or in consulting jobs or serving on corporate boards, Michaud has chosen something else. “You don’t see too many congressmen do what he’s doing, and you know what? We’re all better for it,” said Steve Stanley, a former state representative from Medway who has known Michaud for 50 years. Michaud might have Peggy Daigle to thank for his seat on the East Millinocket Board of Selectmen. Daigle was a longtime town administrator, managing communities from Old Town to Houlton. She retired from her last job at the end of 2016 and returned to her hometown, East Millinocket. Like Michaud, she couldn’t stop serving either, so she ran for a seat on the select board last year and won. This year, she was named chairwoman. But Michaud couldn’t turn down an opportunity to help his hometown. He ran against Tom McDunnah, the son of the town’s longtime police chief. Michaud didn’t have to raise or spend any money or even campaign and won with 75 percent support, 572-196. The community needs all the help it can get. The mill site, across the street from town hall, is abandoned. Smoke no longer rises from the stacks. Nothing has changed since the mill was shuttered for good in February 2014 after a decade of hope and dashed dreams of revitalization. Log trucks still roll through town, but they no longer stop. East Millinocket’s population peaked at 2,600 in 1970 but has been dropping since and now stands at about 1,600. Millinocket has seen an even bigger drop, from 7,800 in 1970 to about 4,300 now. Michaud said the towns were set up entirely for the mills. When they closed, there was no backup plan. The town’s high school, Schenk, where Michaud graduated 45 years ago, may well have closed if not for the generosity of a local resident, Gloria Mackenzie, who famously won nearly $600 million in Powerball in 2013. She gave $2 million to repair the school’s roof before it could be condemned. The biggest challenge is finding jobs and stanching the out-migration. “It’s really a huge task. I understand why people stay home,” Daigle said. Michaud agrees that the task is big, but he doesn’t mind focusing on the small and building the town back up. 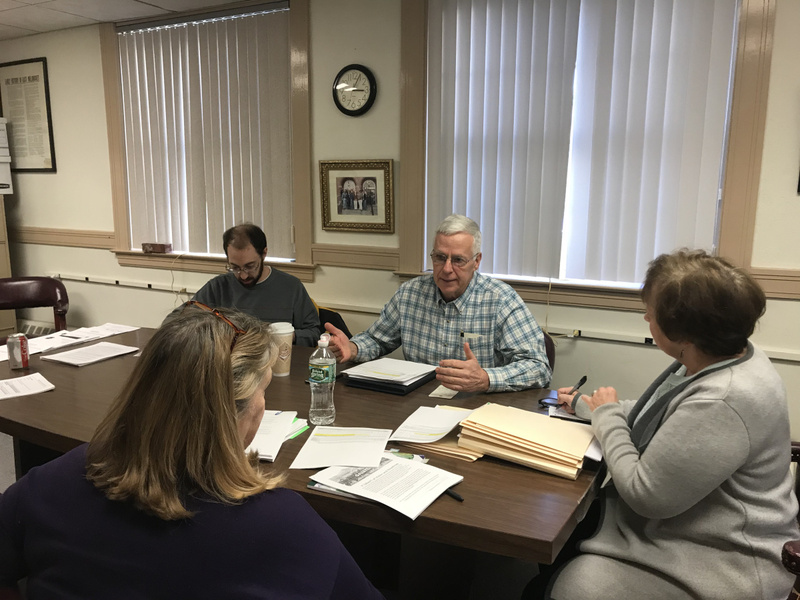 Prior to the Dec. 11 select board meeting, he and two other board members met with a consultant to begin updating the town’s comprehensive plan. Inside the meeting room, he helped Daigle move a table from the wall. He returned a set of old VHS tapes of meetings dating back to 2003. He had watched them to familiarize himself with water and sewer issues that may be coming up. At one point, he did mention casually that the mill’s current owner, Jason Inoff of North American Recovery Management, which invests in obsolete industrial assets like paper mills with the goal of redevelopment, had texted him that morning. They were trying to set up a meeting with Gov.-elect Janet Mills. At another point, he mentioned a federal grant program the town might try applying for. He said the town needs to work harder on pushing for broadband access. This is where Michaud’s connections pay off. “He loves where he’s from and he’s leveraging everything he’s done in his career to help that community,” said Lee Umphrey, who has known Michaud for decades and now heads Eastern Maine Development Corp., which manages the Katahdin Region Development Board, a group Michaud now chairs. Just last week, the organization announced that it would start advertising for a regional economic development director for six Katahdin-area towns, including East Millinocket, which can’t afford to hire its own. Over lunch at the Country Diner in Medway, Michaud admitted he’s still stung about not winning the 2014 election for governor. He also said that if he had the chance he would have remained at his job at the Labor Department, where he mostly assisted with programs that provide veterans with job opportunities. That was a soft landing after losing in 2014, but Michaud was plenty qualified. He had been a longtime member of the House Veterans’ Affairs Committee and was the ranking member of the subcommittee on health. Michaud said he gravitated toward the veterans affairs committee for a simple reason: Maine is among the top five states for veterans per capita. At first, he said, veterans’ groups were wary of him because he never served in the military. But they grew to respect him. Monica Castellanos, who worked for Michaud for seven years when he was in Congress, said Michaud commanded respect. Castellanos said her boss never was interested in accolades or some of the social trappings of D.C. She remembers joking with a former colleague once about calling the congressional office one day when she was on the road. Michaud wasn’t a high-profile member of Congress. None of the bills for which he was a primary sponsor – there were 117 – technically became law, according to the Library of Congress. But his staff said that had more to do with his willingness to collaborate. He didn’t care who got the credit. Another thing that stands out about Michaud is how unfailingly positive he is, even when talking about the hardships East Millinocket and the region have faced. In that sense, Washington and its increasing cacophony of partisanship may have outgrown him. He did say that he’s glad to see a Democrat, Jared Golden, retake the seat in Congress that he held for 12 years. Michaud said he remembers sharing a stage with Golden at a veterans event many years ago in Brewer. Golden was working for Republican U.S. Sen. Susan Collins at the time. Michaud said he heard Golden speak and thought: I hope he doesn’t run against me. “I figured he must be a Republican,” he said. While Golden is still waiting to be sworn in to the 435-member U.S. House of Representatives, Michaud is now one of five on the East Millinocket select board. In the small town, it’s a highly visible position. It’s true. People approach him with ease and he always stops. There is a sense that his energy may be just what the town needs. The timing is good for Michaud. He sees a receptive administration in the form of Janet Mills. He’s widely considered to be in the running for a Cabinet position but would only say that he’s willing to help Mills in whatever capacity she might need. Michaud was able to start drawing from his government pension last year, so he doesn’t need a job. And he does plan to retire for good. Eventually. He has a piece of land overlooking the Penobscot River in Medway. Six and a half acres. He bought it in 1977 for $7,000 when he was still working at the mill. He cleared the land once but may need to again. He hopes to build his log cabin there someday.